How well does Vaishnava philosophy align with the fundmental principles of Buddhism? Revered participants: I stand before you as a representative of the Vaishnava tradition, though, I must admit, I lack the qualities and realizations of the ideal Vaishnava. Still, I will try to present the teachings of this prestigious and time-honored tradition as it has been conveyed to me by one of its most exalted teachers: His Divine Grace A.C. Bhaktivedanta Swami Prabhupada, the founder and spiritual preceptor of the International Society for Krishna Consciousness. 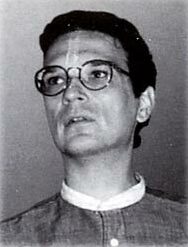 His Divine Grace also happens to be my spiritual master. The Venerable Bodhi Santosh Roshi, leader and spiritual director of your society, has asked me to speak about the Four Noble Truths of Buddhism. This will be a distinct honor, since these same truths lie at the basis of Vaishnava thought. In this brief talk, I will explain how this is so. Before beginning, however, I would like to briefly mention just what these truths are. Please correct me if I am inaccurate in how I express them: (1) the truth of suffering, of the universality of suffering; (2) the truth of the origin of suffering, which is related to suffering as an ontological reality; (3) the truth of the cessation of suffering; and (4) the truth of the Path, which is integrally related to the cessation of suffering. If there are no objections, then, I would like to begin by exploring the first two of the Four Noble Truths: the truth of suffering and the truth of the origin of suffering. In both Buddhism and Vaishnavism, we think deeply about life and material nature—not just the beauty of nature, but also the harsh reality of existence. Contrary to what many might think, to take a good, hard look at the difficult aspects of being is not necessarily negative. Rather, when guided by a self-realized teacher, it can be a first step toward spiritual enlightenment. Unless we are frightfully aware of the distasteful side of life, we are likely to become its victims. Once victimized by material existence, pursuing higher matters is difficult. The plain fact is this: All happiness or pleasure in this world is temporary; it must come to an end. So suffering, to one degree or another, is unavoidable. Therefore, far from being a sour grapes sort of philosophy, to acknowledge and even explore the implications of pain and suffering is simply realistic. Most of the world’s spiritual traditions, therefore, recommend cultivating knowledge of nescience and transcendence side by side, so that one can gradually rise beyond the mundane and become situated in a life of true goodness. This is a gradual evolution that takes time—from ignorance, to passion, to goodness, to pure goodness, or transcendence. 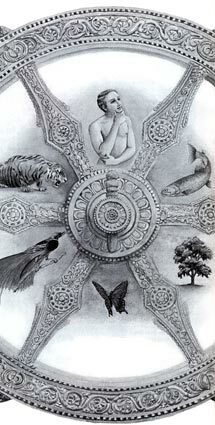 To this end, Buddhism and Vaishnavism, in particular, do not shy away from educating adherents about the stark miseries of material life. Fundamental meditations in both Buddhist and Vaishnava traditions are meant to make practitioners aware of the inevitability of birth, death, old age, and disease, for example, and how these phenomena affect people’s lives. Knowledge of these things can serve as a catalyst to move beyond materialism and to pursue divinity in earnest. 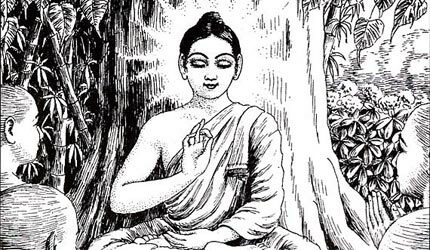 Regarding birth, death, old age, and disease, the Buddha story is familiar to everyone here today: Siddhartha Gautama, the Buddha, was a noble prince, and in his youth he was sheltered from the miseries of life. When the prince traveled out of his kingdom for the first time and saw a dying person, a person giving birth, a diseased person, and an aged person, he asked his servant if such hardship, or suffering, was common. His servant responded by telling him that these calamities, in one way or another, necessarily afflict man in his sojourn through life. At that moment the Buddha resolved to find the solution to suffering. The ancient Vedic texts of India home in on three kinds of suffering: suffering caused by one’s own body and mind, suffering caused by the bodies and minds of others, and suffering that comes from natural calamities. In Sanskrit, suffering is known as duhkha, a word that carries implications of “pain,” “distress,” “grief,” “affliction,” and “frustration.” I believe you use this same term. In your tradition, you say that duhkha comes from avidya, or “ignorance.” We say the same thing. My spiritual master, Srila Prabhupada, began his work in the West with the notion that people are suffering due to want of knowledge. He claimed that spiritual knowledge was the only thing that could lessen their suffering. For this reason he tirelessly labored to translate ancient Vedic texts and to personally teach how to live a life of spiritual fervor—he felt deeply the suffering of others and wanted to help them rise beyond such suffering. Ignorance begins with bodily identification. When the life- force, or the soul within the body, misidentifies with the aggregate of material elements—which is only the body, even if we see it as our actual selves—it begins a life of illusion, and this is the seed of all suffering to follow. The Bhagavad-gita, a central text for the Vaishnava tradition, boldly declares that the body and soul are different and that ignorance, illusion, and, consequently, suffering, come from the soul’s erroneous identification with matter. I realize that this is a touchy subject in Buddhist teaching. Bodhi Santosh Roshi and I have spent much time discussing the intricacies of Buddhist thought on the soul and reincarnation. It is beyond the scope of this lecture to definitively talk about the various Buddhist positions on this point. I will, however, say—and I know that Bodhi Santosh Roshi agrees—that the earliest forms of Indian Buddhism accept the Vedic conclusion about the nature of the soul and reincarnation. This is true, too, of most forms of northern Buddhism, or Mahayana Buddhism, and it is fundamental to Tibetan Buddhism as well. So let us use that as a starting point. What are the implications of bodily identification? Well, for one, bodily identification breeds desire, or craving. In Buddhism, this is called tanha or trishna, words that imply “greediness” and “pandering to the senses.” If you have a body, it is natural to be concerned for its needs. But most people go far beyond the body’s needs. They become absorbed in excessive sense gratification. Prabhupada compared sense gratification to using salt in a food preparation: If you add too much you will spoil it, and if you add too little you will spoil it as well. Thus, both Buddhism and Vaishnavism propose a “middle path,” if you will, a path that does not deny the senses but does not overly indulge them either. As the Gita’s second chapter informs us, all misery begins when one contemplates the objects of the senses. This contemplation leads to attachment and, eventually, selfish desire. This gives rise to anger. Why anger? Because the pleasures of this world are temporary, as we have noted, and so they inevitably come to an end—we eventually lose the objects of our attachment. This makes us angry. When we are angry, the Gita says, we can’t think straight. We become bewildered. This leads to loss of memory. At this point, intelligence is lost. (The Gita defines intelligence as good memory and fine discretion.) Naturally, in such a state of mind one can’t pursue spiritual life. So these are some introductory ideas about suffering and the causes of suffering. The third Noble Truth is that of the cessation of suffering. If all suffering comes from desire, then the cessation of suffering comes from the extinguishing of desire. This is somewhat problematic. Where there is self, there is self-interest. It is thus natural to desire. We want the best for ourselves and our loved ones. This is natural. The question, then, is not desire, but rather inordinate desire, or that desire which, again, is unnecessary or excessive. The Buddhist and the Vaishnava both work at quieting unnecessary passions or desires, and, conversely, cultivating desires of the spirit, pursuing passion for truth. To dedicate one’s life to the path of Buddhism or Vaishnavism requires commitment, determination, and, yes, passion. One must desire the goal of Buddhism or Vaishnavism, of one’s chosen path. Someone may put forth the Zenlike idea that one only reaches the goal when one ceases to pursue it. But this is only partly true. If one pursues truth for truth itself, devoid of ego, this is entirely appropriate. In other words, one must pursue it for the right reasons. Then it is okay. If one does not desire enlightenment, at least on some level, one will never achieve it. The point is to get beyond selfish cravings, self- interested desires, and by so doing to realize one’s bonding with all that exists. In Vaishnavism this is called the brahma-bhuta stage, wherein one sees all living beings equally and does not distinguish between them or judge them because of material differences. If one can reach this level of enlightenment, one can raise oneself beyond all material suffering. In Buddhism, it is said that this is achieved by following the Path—which means different things to different people. In Buddhism, the Path tells us to do things in “the right way”—it is the Eightfold Path, consisting of the right view, right thought, right speech, right action, right livelihood, right effort, right mindfulness, and right concentration. In Vaishnavism this is called the mode of goodness, and it is difficult to achieve. Indeed, in this age few are able to truly act properly, and if, after much practice, they find that they can, they will be doing a great thing for themselves and for the world around them. The Eightfold Path is thus the most noble of goals. I must say, however, that, in my opinion, if one actually achieves this goal—if one achieves it to perfection—one will be acting in Krishna consciousness, or Vaishnavism. You see, my understanding of Vaishnavism is not some sectarian religion that pits itself against all other religions. No. Rather, I see Vaishnavism as sanatana- dharma, or the eternal function of the soul. Thus, I see all bona fide spiritual traditions as but various expressions of Vaishnavism. It is for this reason that, when I contemplate the Eightfold Path of Buddhism, I can only see it as acting for God, for Krishna, because to do something in the right way, as I understand it, means doing it for Him. Ultimately, to act properly is to act for our source. To behave in the right way is to behave in the way in which our creator intended. This is a touchy issue, I know. Buddhism does not traditionally deal with God or His nature. But the God question haunts us even if we find Him irrelevant or not necessary for liberation, as is often the case in Buddhistic thought. When we deal with questions of ontology and teleology—the questions concerning where everything comes from and where everything is going—we can’t help but consider the existence of God. What religion in general, and Vaishnavism in particular, has to offer is this: positive information about the world beyond suffering. Both Buddhism and Vaishnavism agree that this is a world of suffering, but what lies beyond this world? In Vaishnava tradition, we learn of Vaikuntha, the spiritual realm, a place where the chief characteristics are eternity, knowledge, and bliss—the exact opposite of temporality, ignorance, and suffering. Although the material world is a land of exploitation, the spiritual realm is described as the land of dedication, the land of love. There are Buddhist traditions, too, that speak of higher realms—lands of demigods and higher beings. But, to my knowledge, only in the Vaishnava tradition does one find exacting details about the abode of Krishna, the Supreme Personality of Godhead, and how to get there. This is where I would like to go if I ever achieve perfection on my path, and that is perhaps why I have chosen the path of Vaishnavism. Recently, when the Dalai Lama was in New York, I was fortunate enough to hear him lecture. After explaining that he respected all spiritual paths and that all paths have merit, he admitted that he was particularly partial to Buddhism, and that is why he is a Buddhist. I must confess that I too share a similar prejudice. While I acknowledge that all revealed traditions are respectworthy and have a good deal to offer, I can only attempt to approach the truth through the Vaishnava tradition. This is my approach to spiritual life, and I hope you will indulge me that preference. Thank you very much. Lord Buddha, a powerful incarnation of the Personality of Godhead, appeared in the province of Gaya (Bihar) as the son of Anjana, and he preached his own conception of nonviolence and deprecated even the animal sacrifices sanctioned in the Vedas. At the time when Lord Buddha appeared, the people in general were atheistic and preferred animal flesh to anything else. On the plea of Vedic sacrifice, every place was practically turned into a slaughterhouse, and animal-killing was indulged in unrestrictedly. Lord Buddha preached nonviolence, taking pity on the poor animals. He preached that he did not believe in the tenets of the Vedas and stressed the adverse psychological effects incurred by animal- killing. Less intelligent men of the age of Kali, who had no faith in God, followed his principle, and for the time being they were trained in moral discipline and nonviolence, the preliminary steps for proceeding further on the path of God realization. He deluded the atheists because such atheists who followed his principles did not believe in God, but they kept their absolute faith in Lord Buddha, who himself was the incarnation of God. Thus the faithless people were made to believe in God in the form of Lord Buddha. That was the mercy of Lord Buddha: he made the faithless faithful to him.